The Manor ~ Roundball Manor - The House that Basketball Built. At first glance Roundball Manor may sound like a place, but it is much more than that. Websters defines a Manor as the Main House on an estate, a Mansion. We define Roundball Manor as the Main House on The NBA estate. A Manor beckons and demands respect as does the game called Basketball and its enduring legacy. As such, this Manor has been built as a vehicle to give this game its due respect. It is here to provide intelligent NBA analysis and entertainment for the avid fan. Roundball Manor represents the intangibles that do not show up on a stat sheet. It represents minor bench contributions on a winning team, diving for a loose ball, a selfless play, offensive rebounds, boxing out, solid defense, and a basketball ideal that purists have come to respect throughout the history of this great game. 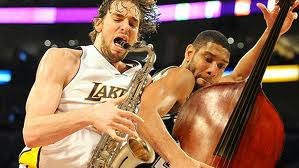 Welcome to Roundball Manor, where basketball makes beautiful music.